A better script would be hard to imagine for the Pahrump Valley High School wrestling team. 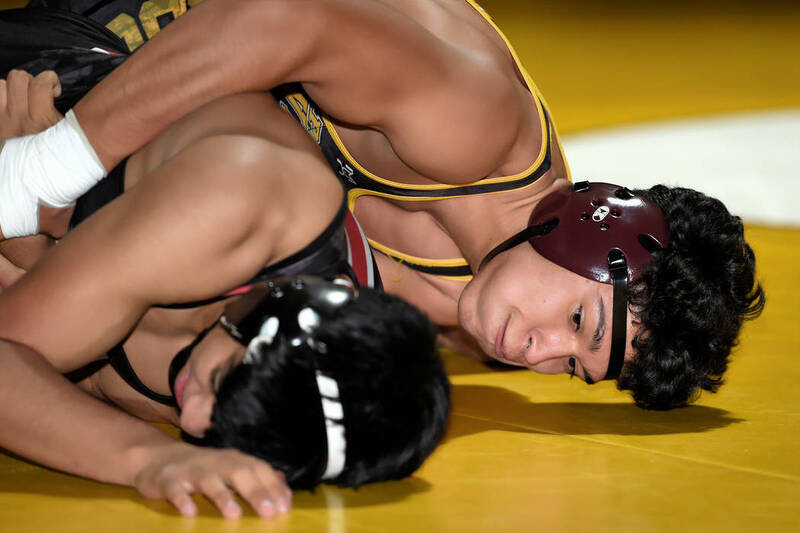 Peter Davis/Special to the Pahrump Valley Times Pahrump Valley senior Isaak Cruz takes control of Juan Vargas of Western on his way to a third-period pin at 145 pounds Wednesday night during the Trojans' 42-35 win over the Warriors. Peter Davis/Special to the Pahrump Valley Times The effort shows in Tristan Maughan's face as he battles Western's Lydell Hamon at 170 pounds Wednesday night. Maughan recorded a fall in 1:49 to pull Pahrump Valley within five points. Peter Davis/Special to the Pahrump Valley Times Wearing protective gear for his injured shoulder, Pahrump Valley senior Dylan Grossell pinned Western's Jesus Perez during the second period Wednesday night as the Trojans clinched their second consecutive Sunset League win with a 42-35 victory over the Warriors. 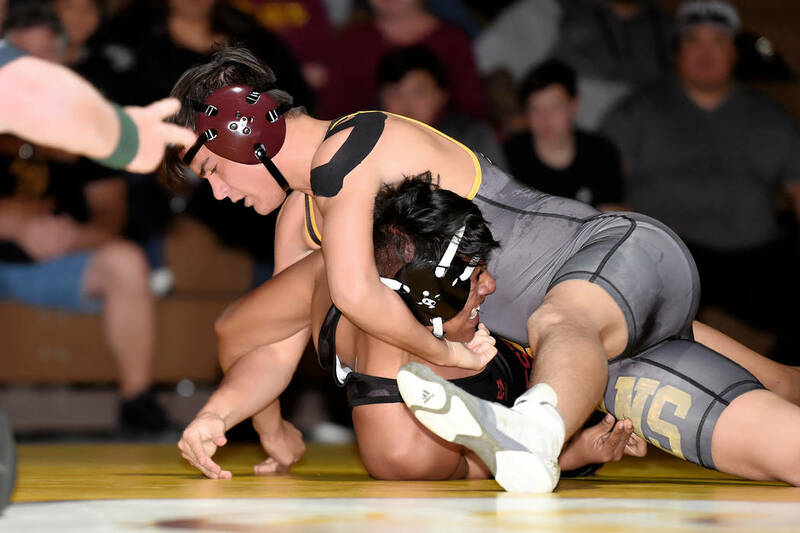 On Senior Night, three seniors stepped up and recorded crucial pins as the Trojans rallied from a big early deficit to defeat Western 42-35 on Wednesday, wrapping up their second consecutive Sunset League championship. The Trojans won only three of the 10 contested bouts, racking up 24 points in forfeits. Even so, it was unlikely regular decisions would be enough to win the match, putting pressure on seniors Isaak Cruz, Dylan Grossell and Tristan Maughan. Cruz stepped onto the mat at 145 pounds with his team trailing 29-0 after Trojan wrestlers did not register a single point in four of the six opening bouts. The momentum was with the Warriors, who sent out Juan Vargas to battle Cruz. After a scoreless first period, Vargas finished the second strong, and a takedown with three seconds left gave him a 3-0 lead. But Cruz took the lead with a takedown and two near fall points, and after a Vargas escape tied the score, Cruz took him down again and was in control until the fall at 5:23. Next up was Grossell, who reasonably could have been expected to sit this match out. He missed most of the season after fracturing a shoulder playing football, returned to the lineup briefly and then skipped Saturday’s Chaparral Invitational. Wearing a brace on his left shoulder, Grossell took command in the first period against Jesus Perez at 152, registering a takedown 20 seconds in and eventually earning three near fall points. Grossell earned the pin midway through the second period. Not bad for someone who probably should have been watching from the sidelines. The first of four Western forfeits came at 160, which is why Rieger moved up Maughan to 170. 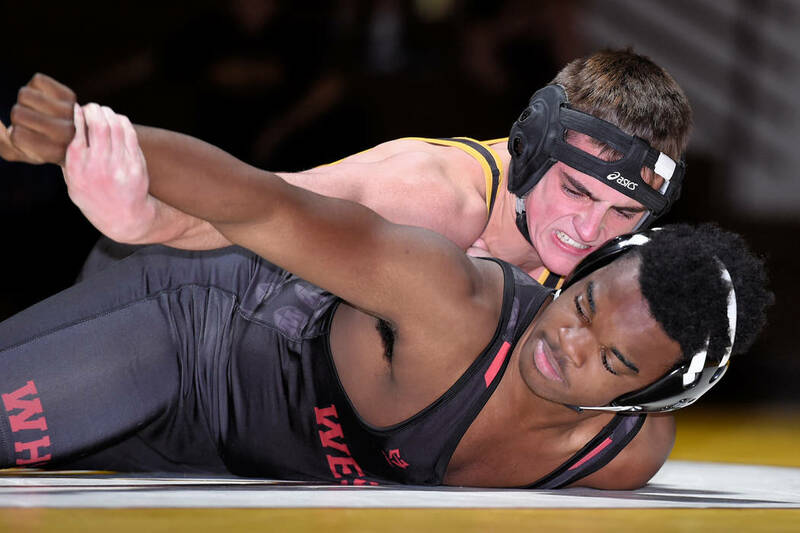 “My coach wanted to me to get a match on my senior night,” as Maughan put it, so he went up to 170 to tangle with Lydell Hamon. Despite it being the first time wrestling at 170, Maughan made quick work of it, posting the pin in 1:49. “I stuck him right on his back,” Maughan said with a smile. That win cut the Warriors’ lead to 29-24, and with the forfeits coming up at 182, 220 and 285, the Trojans knew they had wrapped up the Sunset League title.